This clash features two sides that are firmly in the bottom half of the Euroleague at the moment but there is a strong history between these two sides. There have been six clashes in the Euroleague and to this point every game has been won by the home side. 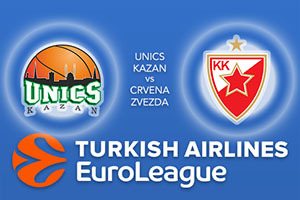 This is something that Unics will be desperate to continue but the Belgrade side knows that runs are made to be broken. The Kazan side may have a 1-4 record but they’ll have a bit of confidence coming into this game. Not only did Unics win their last game, they managed to defeat Fenerbahce in Istanbul. The Turkish team were unbeaten going into that game and this could be the catalyst that the Kazan side required this season. There is no doubt that the home team has some big game players and Keith Langford is currently the top scorer, by some distance, in the Euroleague. He has managed to provide an average of 24.8 points per game, which is definitely something that has to give his team-mates confidence. Kazan need to go on a winning run and this Thursday gives them the chance to do so. Zvezda have a 2-3 record at this stage of the Euroleague and they really need to score more points. Their statistics indicate an average of 70.6 points per game, which is the lowest scoring record in the season. Their leading scorers, so far, are Marko Guduric, with an average of 12 points per game, Ongjen Kuzmic, with an average of 10.2 points per game which is the same tally as Marko Simonovic. The Belgrade side does have a strong defence with an average of 72.2 points allowed, but there is a need to be sharper up top. This is genuinely a game that could go either way so take Crvena Zvezda mts Belgrade at +7, which is provided at odds of 1.90. If you’re looking for the Over/Under market, look to go UNDER 150.5, at odds of 1.90, with your basketball betting antics this Thursday. Bet Now!